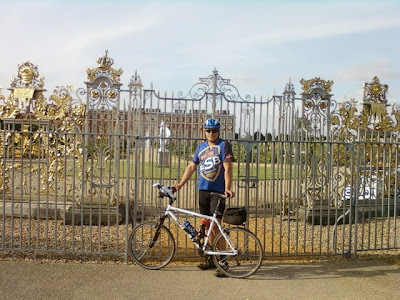 Ian Driver writes: When I first mentioned the idea of doing an Audax through the middle of London, many people seemed intrigued and interested, but had reservations about the reality of it. So for all the people who wondered, I though I’d write a brief report. This Audax is a 101K event, named the London Sightseer. It begins and finishes in Twickenham and takes in as many of the London sights as is practical. This is not an event to use as a “how quickly can I ride a bike” challenge. The route sheet covers four sides of A4 and is divided into nine sections. Navigation was obviously going to be a time consuming business. Hence you could average as little as 10kph and still get round in time. I had one other taker from Cambridge CTC, Chris E, and a pal from North Herts CTC to make it three. After an early start, we started from Twickenham, soon joining the path along the river Thames. There is disappointingly little path along the water side here, so we were routed along quite a few residential streets with short stretches by the river itself. 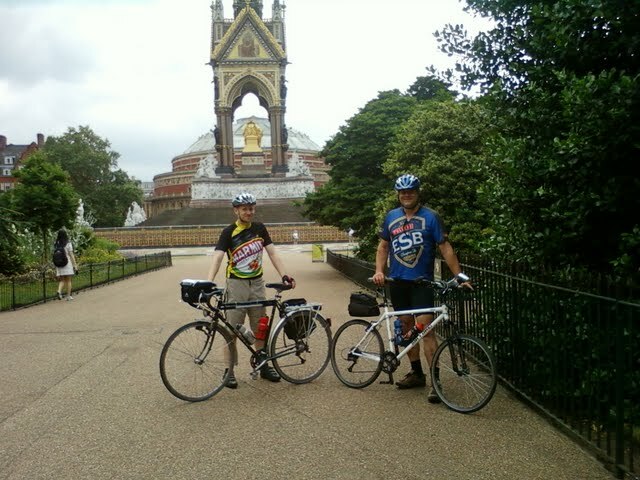 This eventually led us to Kew Steam Museum and on to Kensington via back roads. These earlier stages could feel a little like a commute, albeit a very posh commute. We turned into Kensington Park, passing the Albert Memorial (below) and the Albert Hall, then into Hyde Park and passed the Princess Diana Memorial. The busiest part of the ride began now. The use of cycle paths was extensive, but some busier road sections were unavoidable. By busier I mean The Mall, Buckingham Palace, Admiralty Arch, Trafalgar Square, The City with St. Pauls and the Gherkin building. About as busy as it gets with the sort of cycle lanes that disappear when you need it the most. You know what I’m talking about. This led us to The Tower of London and Tower Bridge eventually. This section was very slow going. It was not sensible to look at your map rather than the road. So we were stopping every couple of hundred yards to check the route sheet. At St. Catherines Docks, were back on the cycle paths and following the roads and the Thames through to Canary Wharf and onto Greenwich for the manned control at 42 km. This 42km had actually taken about 4 hours. You really do need to check your route sheet a lot but you do have time to stop and admire the sights. We ate lunch and admired the river and the old naval college in the background here. Now crossing through the Greenwich foot tunnel, we climbed the not inconsiderable hill up to the Greenwich Observatory and its lookout point. If I do this ride again, I will stop here and eat, the views over the city and the river are top notch. South of the river is more of a labyrinth which took 3 of us combined to navigate correctly. You pass the Millennium Dome and work your way along a designated cycle track. This passes through every building site and disused industrial unit in London it seems. Was glad I was on an off road bike at times. 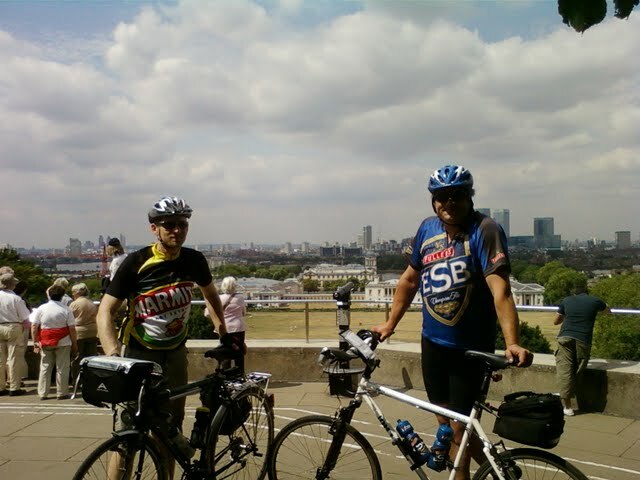 You get into the sights of the South Bank after a few miles and back into the sights, London Eye, HMS Belfast etc. etc. The ride becomes steadier after this point. Crossing several bridges at Chelsea and Putney following embankment, Houses of Parliament etc. You then get into the joys of Richmond Park, which is huge. You suddenly find you’re on leafy lanes cycling with nothing but countryside and deer in view. And by now there are no, what have by now become, blessed busses and you can ride for a couple of miles without that vast route sheet to haunt you. On the home leg now, river and cycle paths to Hampton Court Palace and finish with 65 miles on the clock 9 hours later, thanks to navigation for the slow time. It was an experience I thoroughly enjoyed. There are large sections of riding on non descript paths and little time to enjoy the sights, but a unique experience and the sights are many. I will adapt the route sheet for days out independently. Oh that route sheet. I can stills see it in my sleep……… Ian Driver. 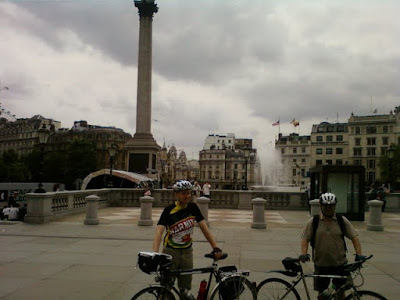 There's another London Sightseer 100km Audax on Sunday 5th September. 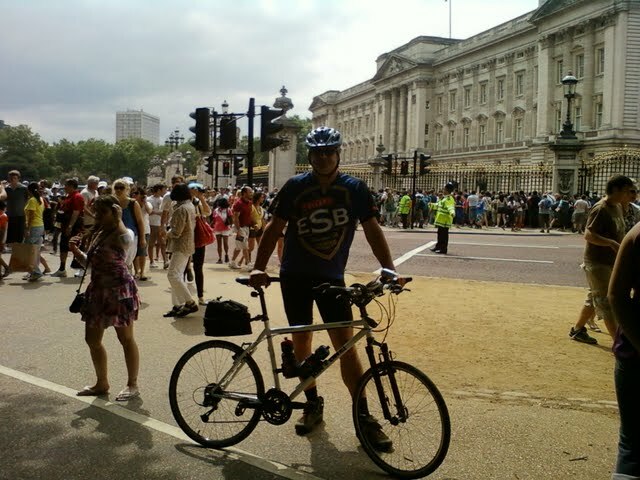 Read Gareth's ride report here.